The esophagus is the tube that runs from the mouth to the stomach. Food passes down this tube to the stomach. Esophageal cancer is the growth of cancer cells in this tube. Cancer occurs when cells in the body divide out of control. If cells keep dividing, a mass of tissue forms. These are called growths or tumors. If the tumor is malignant, it is cancer. They can invade nearby tissue and spread to other parts of the body. 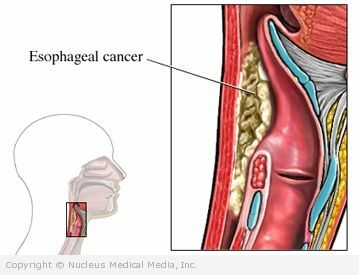 The cause of esophageal cancer is unknown. The doctor will ask about your symptoms and medical history. A physical exam will be done. This type of cancer can spread very early. This can make it difficult to cure. People who have risk factor, especially reflux, should talk to their doctor about screening tests. Screening tests will look for cancer in people before they have any symptoms. Surgery may be needed to remove the tumor. Your doctor may also need to remove all or part of your esophagus.A plastic tube may be put in place of the missing esophagus. Chemotherapy is the use of drugs to kill cancer cells. Chemotherapy may be given in many forms. It may be pills, injections, and/or catheters. The drugs will enter the bloodstream and travels through the body. It will kill mostly cancer cells. Some healthy cells may also be killed. Chemotherapy alone will not cure this type of cancer. It is only used when the cancer has already spread and cannot be cured. At this point it is used to help shrink the tumor, ease pain or control nausea. Chemotherapy and radiation therapy together are better than radiotherapy alone. It has also been shown that these two treatments may be as effective as surgery alone. This is three step therapy. It includes chemotherapy, radiation therapy and surgery. This has been shown to be a most aggressive form of therapy. It may be the best way to cure a patient of their disease. High-intensity light may be used to try to kill cancer cells. A combination of drugs and special lights are used to try to kill cancer cells. The medication is absorbed into the cancer cells. The special lights stimulate the medication to kill the cancer cells. This therapy is a promising treatment. It is only appropriate in a very small number of patients. There are limits of how far the infrared light source will travel into the cancer itself. The tumor must be very small. It is also not used in cancer that has spread to any lymph nodes or other structures. If you are diagnosed with esophageal cancer, be sure to follow your doctor’s instructions. Don’t smoke or use other tobacco products. If you smoke, quit. Drink alcohol only in moderation. Moderate alcohol intake is no more than two drinks per day for men and one drink per day for women. Get medical treatment for gastroesophageal reflux disease.